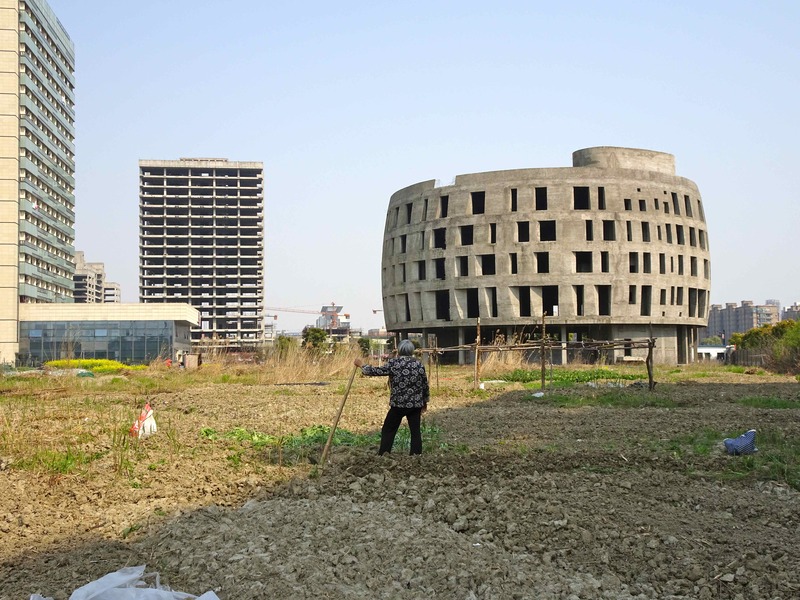 This is a report about an « unfinished rotten » building in Hangzhou. 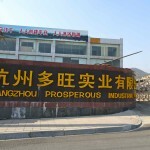 The city of Hangzhou is now actively preparing for the G20, which means, like for all mega-events in China, that the ultimate priority is put on the city’s image (市容 shirong): everywhere, one can notice large-scale demolition, renovation or rehabilitation of buildings. That is why I was afraid to find out that this « urban abnormality » would already be taken down… Well it was not! 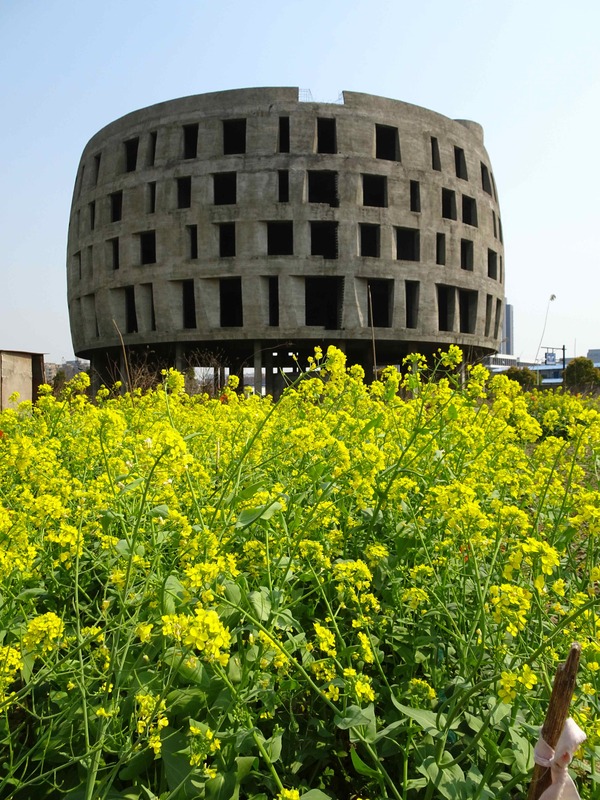 Let me introduce Hangzhou’s famous « big liquor barrel », an unfinished construction which remained abandoned for more than ten years and which does not seem affected by Hangzhou’s fast urban transformations! 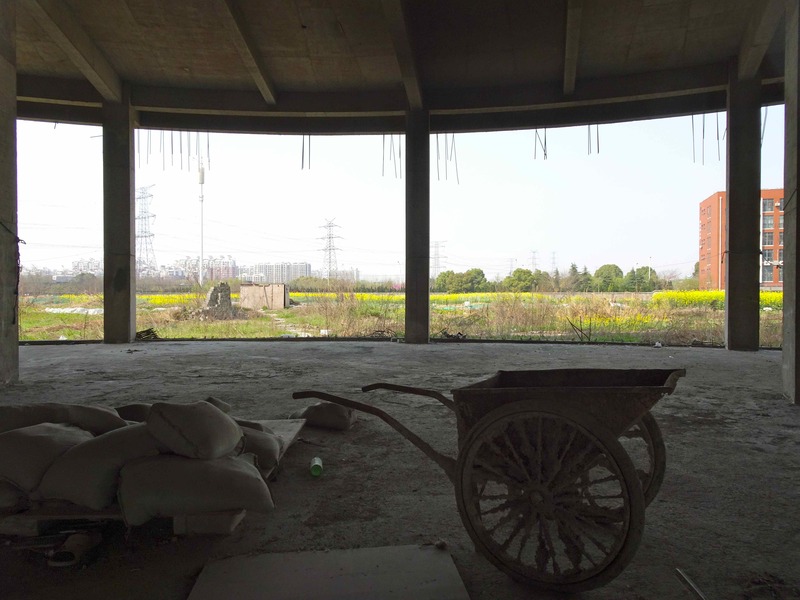 This place is one of the only abandoned places in Hangzhou, a very rich prefectural-level city located in Zhejiang province, which is developing extremely fast. 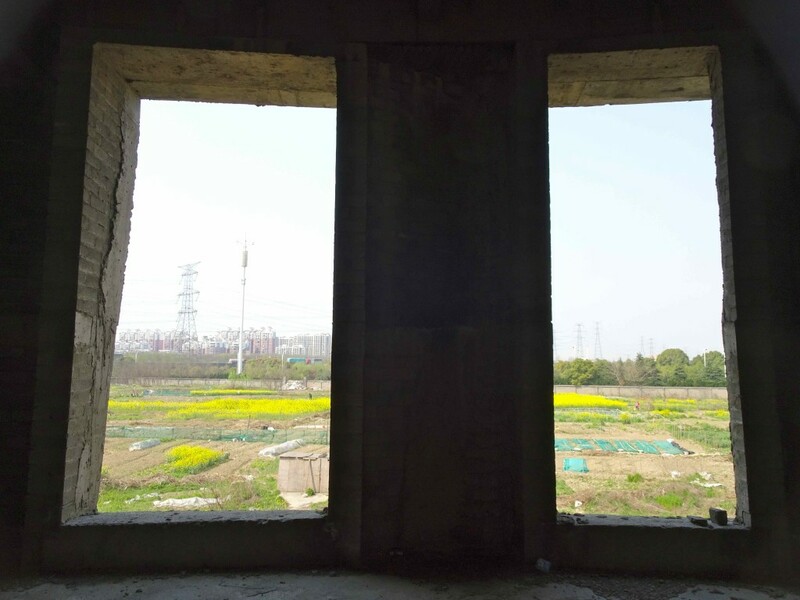 The rapidity and ambition of urban planning, unlike in many places in China, does not leave many abandoned buildings in the process: demolition is very fast, construction is also very fast. 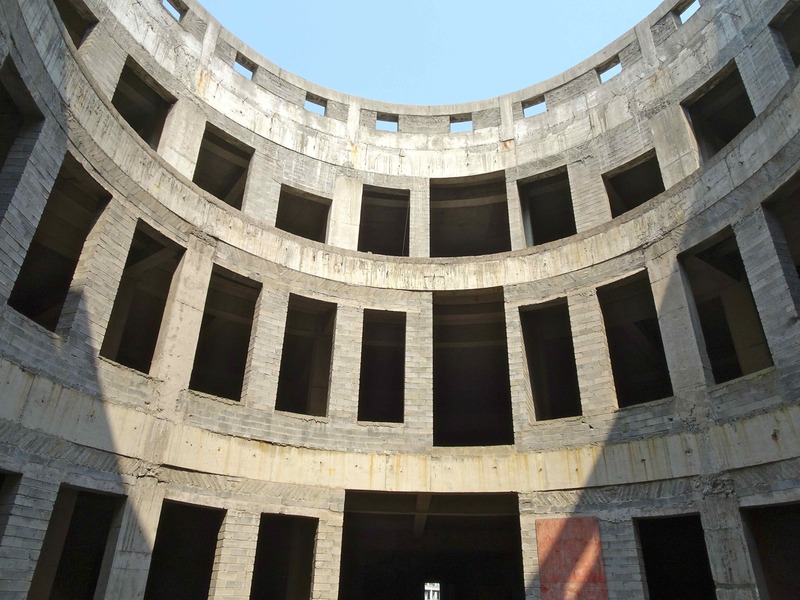 Yet, this « unfinished rotten » building (烂尾楼 lanweilou) is one of the most famous abandoned buildings in Hangzhou. It became very well-known because of a wave of newspaper articles in 2013: all were reporting about this « liquor barrel » (大酒桶)-style building which had been abandoned for more than seven years. This building was conceived by a local company involed in the planning of a very large scientific park. 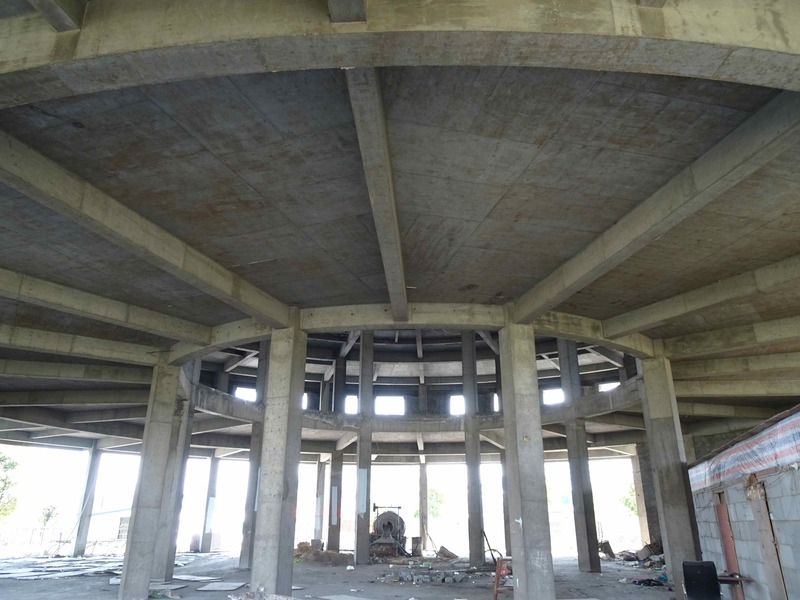 According to news reports, construction started in 2006 but a fire put the process on hold until now. It seems that a rehabilitation company was supposed to repair it from 2012, but maybe the financial limits are still too high. 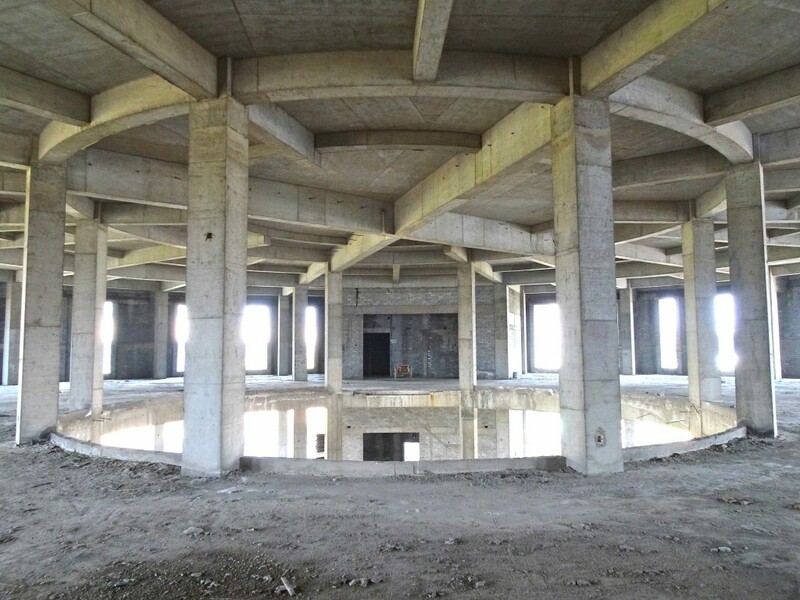 The building is included in a scientific park which was not developed following the same timeline. 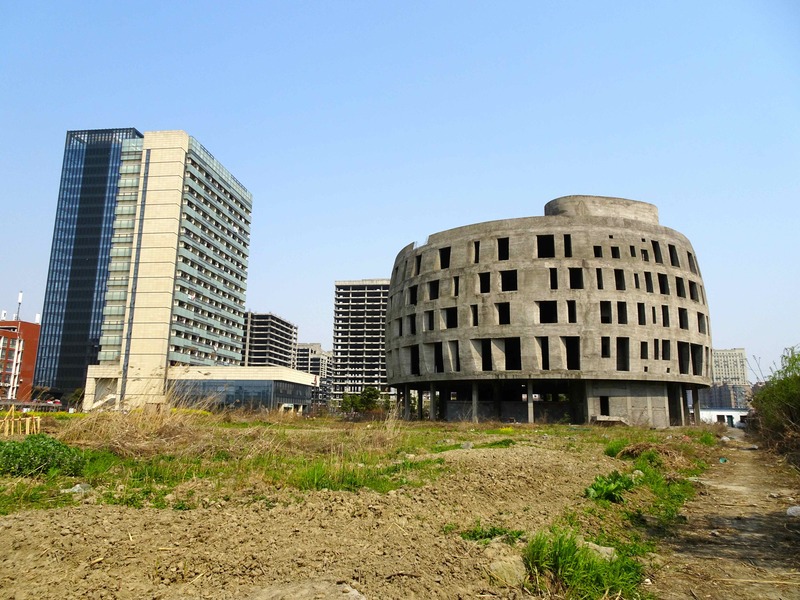 Some buidings are already finished while others are still in construction and some are even unfininshed and abandoned. 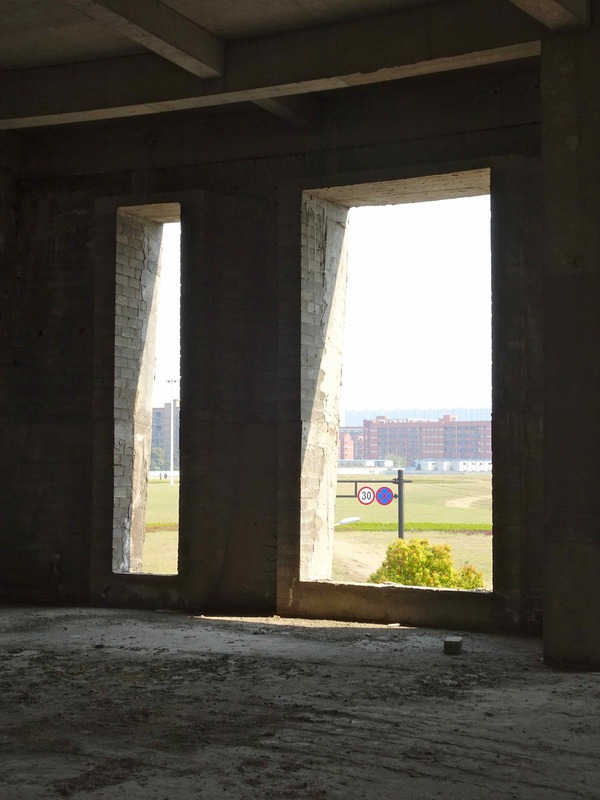 Next to the building, there is also a huge unused piece of land and parking lot, which are both mostly empty spaces but could have been originally planned as a big square with a parking space. 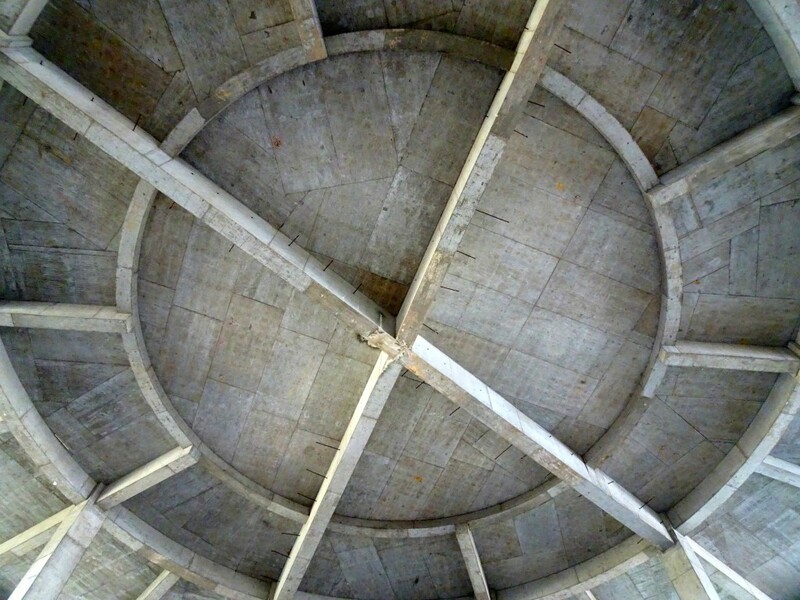 When I got to the building, I was happy to realize that its architecture was really unusual and worth coming from so far away. 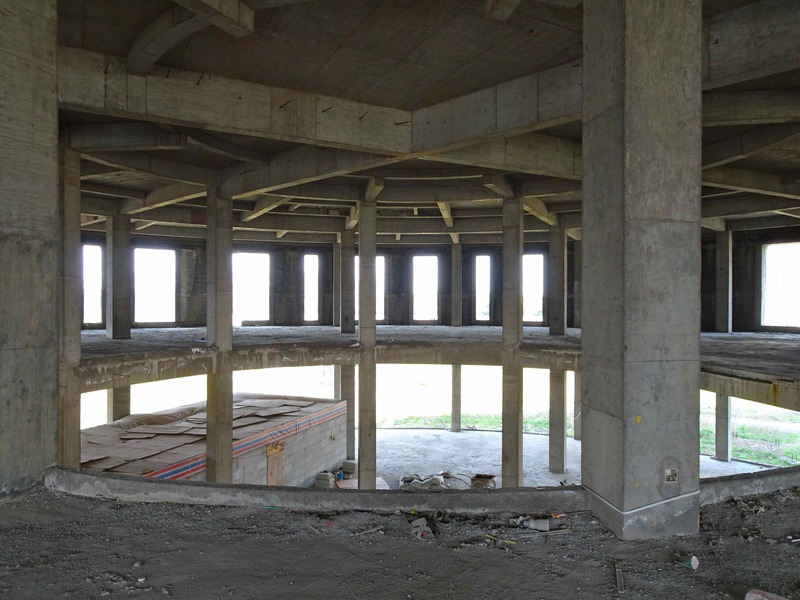 Indeed, unlike Brïn, who loves concrete, I prefer exploring places with a past… I make an exception when their concrete structure makes me really impressed by their raw materiality and geometry, a bit like Datong’s unfinished architectural projects did a few months before. 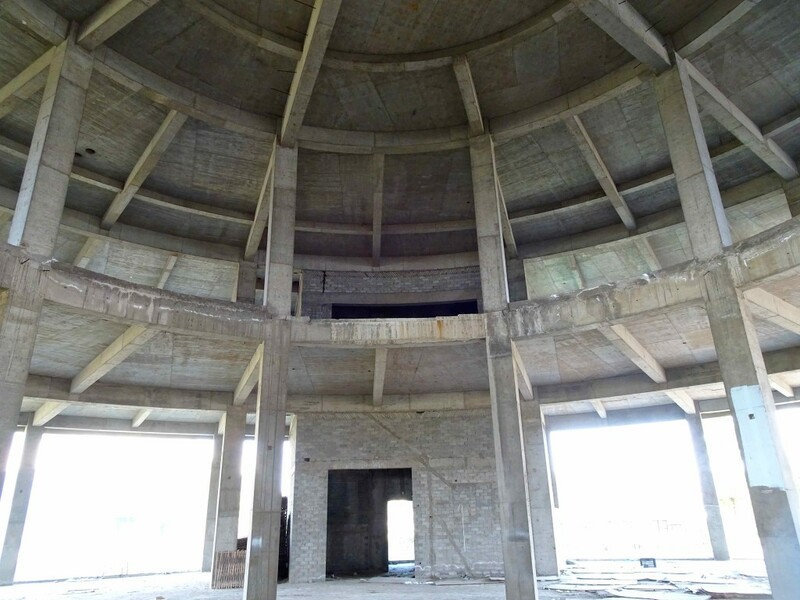 According to the pictures I could find on news reports from 2013, it seems that in the past years or months, fresh cement was put on the building to make it look better and more harmonious (less dangerous too, maybe). It has five floors. I did not go on the rooftop this time because I heard people play with a basket ball there and was afraid to get myself in trouble as I was alone on this visit. I could visit the intermediate floors peacefully, however. What I really like about some abandoned constructions is that their original architecture makes them more beautiful in their concrete state than after decorations. 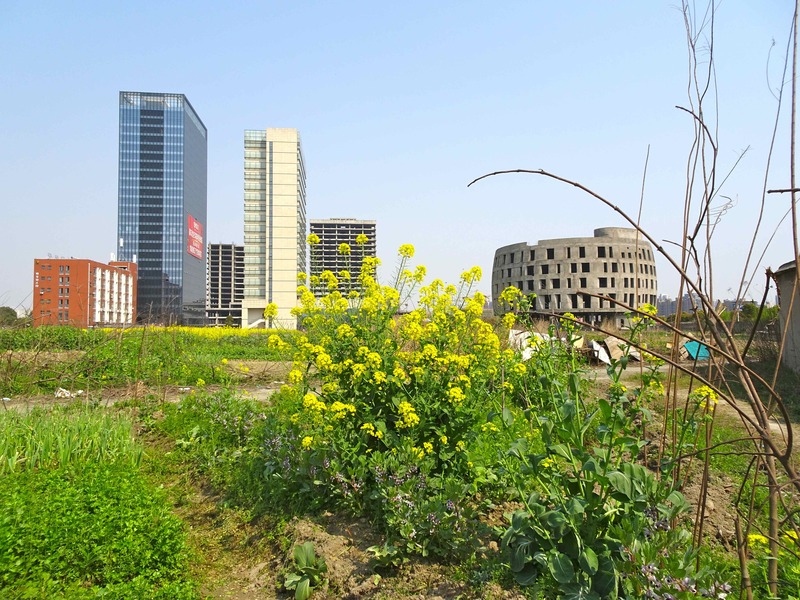 Clever seniors: using the wasteland to grow vegetables! You can notice in the picture below that another « unfinished rotten » building appears in the back of the photo but as you can see, I did not think it was an interesting one: the « liquor barrel » shape was much more appealing. I found a very interesting retired lady who said she liked to use her free time to do some gardening. These ordinary people went in the place and noticed that the land was not used, so they thought it was a waste not to use it. I quite like the result. 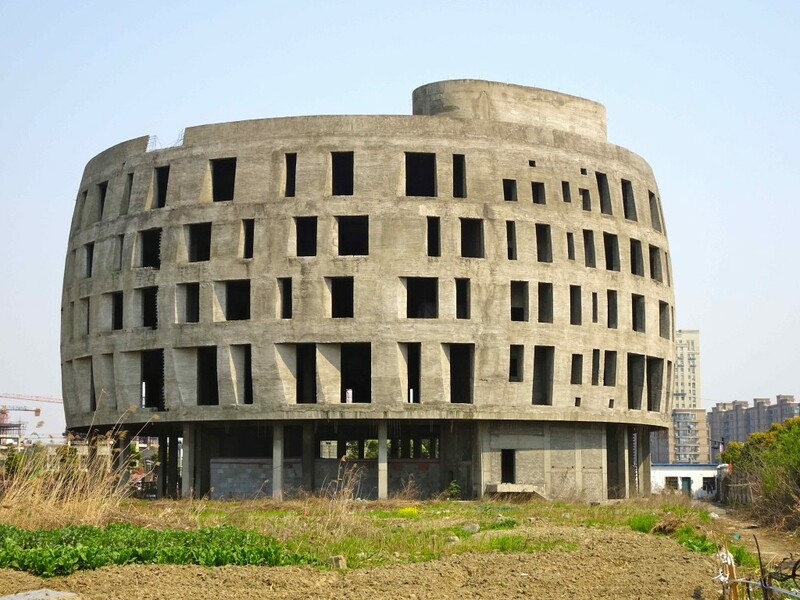 This entry was posted in Abandoned unfinished constructions / 烂尾楼, Shanghai, Zhejiang, etc. 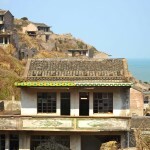 / 上海，浙江省, Zhejiang province / 浙江省 and tagged unfinished-abandoned building (烂尾楼). Bookmark the permalink.